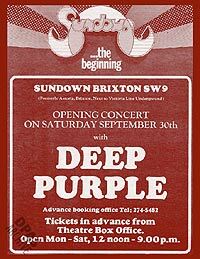 Deep Purple History: In September 1972 the venue was looking for a big band to play the first rock show under the buildings new Sundown name, and the promoters secured Deep Purple, who were on their big UK Machine Head tour. It was the closing show of the tour and their only London concert, promoted by Pete Bowyer of NEMS. It was to be over twenty years before Deep Purple played there again, on Nov 7/8 1993, with the second night generally regarded as Blackmore's last great UK show with the band. He quit five shows later. Deep Purple played there again with two shows on March 8/9 1996, as part of Steve Morse's first UK tour in the group. Audience tapes of all these reunion shows are kicking about and some video. History: This venue was originally opened as the Paramount (later Odeon) Astoria Theatre in August 1929, seating almost 3000 people. It cost a quarter of a million pounds to build and the site was formerly a garden. The cinema was important as it was the very first example of the "atmospheric" interior in Britain - with the interior and side decoration designed to give the impression that the audience were sitting in an amphitheatre set in an Italian garden. It remained in use as a single screen cinema (with live variety shows on the large stage) right through until closing at the end of July 1972. It reopened in September 1972 as the Brixton Sundown, one of a short-lived chain of three discotheque / rock music venues operated by the Rank Organisation (another was in Edmonton), with the stalls seating removed. It was this opening night show which saw Deep Purple as the first rock band to ever play there. The Sundown venture was not a success for Rank and in January 1973 they closed the venue, and used it as a warehouse. Happily demolition plans the following year were avoided and the building was listed Grade II (later raised to Grade II* - a rare accolade which recognised the importance of the interior). After ten years the building was restored and reopened in March 1981 for rock gigs (UB40 did the honours) as the Fair Deal. 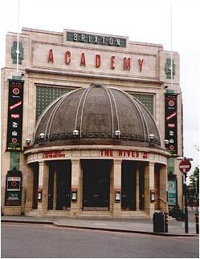 Brixton was still suffering the after affects of the 1981 riots and the venue closed again at the end of the year, before it was bought by Simon Parkes off the brewery who then owned it, and reopened in October 1983 at the Brixton Academy with a reggae act. It hosted a lot of similar acts, but was also used by bands for tour rehearsals and video shoots. Gradually the reputation of the venue saw it become a must-play hall for most bigger acts. In 1995 Parkes sold the venue to new owners who continued to host big rock gigs (although it was almost bought by a church group - rebuffed, they went off and bought The Rainbow instead). They also improved the venue, refurbishing the exterior and increasing capacity to just under 5,000. 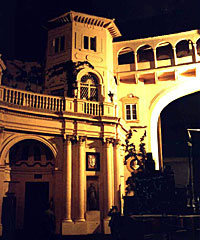 It was voted NME's 'Best Live Venue' a record nine times between 1994-2005. Viewing: The exterior can be viewed from the street. Although you can get some idea of the building when attending gigs, it is also often opened to the public during London's Open House weekend when you can appreciate the architecture in less hectic circumstances. Location: Stockwell Road, Brixton, London. SW9.